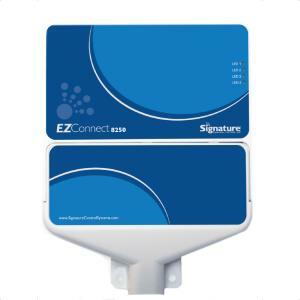 The EZ Connect™ 8250 controller from signature Control Systems is designed to provide flexibility, ease-of-use, and power. The EZ Connect™ 8250 controller is equipped with an integrated 10Mbit ethernet port, so you can directly connect it to an existing local area network (LAN or WLAN) via a direct wire connection, powerline adapter of Wi-Fi bridge. The 8250 contains powerful diagnostic, flow monitoring, solenoid fault detection and the capability for email notification. When equipped with the optional Intelligent Watering Software, approved by WaterSense®, this controller can fine-tune your irrigation system and precisely irrigate each microclimate individually by programming in all gardening features of the irrigated landscape, thereby saving you water, time, and money. Pair that with the ability to remotely access the controller from anywhere in the world using the SIGNATURE SHARE™ app (iOS® or Android™), and you can see why this series offers you the smart way to water.